Relisting boat due to last purchaser not making deposit and no communication. 19.5 Ft. Center Console w/ 135 Mercury Optimax Motor & Aluminum Magic Tilt Float-On Trailer. Price includes: Like New Garmin GPS/Fish Finder w/color screen, New (in box) VHF580 Marine Radio, T-Top, Gold Color Rod Holders, Seat Cushions, Life Jackets, Flair Gun, Duel Batteries and 85 gal. Fuel Tank. Brand New Trailer Tires. Aluminum Bow Rail needs to be rewelded. Sending Unit not working on fuel gage which I believe is causing engine dash light to stay on. Boat needs to be polished to remove chalking. Engine cover needs repainting. Selling in "As-Is" Condition. Call 727-514-3584 with any questions. Recommend you have a local mobile marine mechanic inspect before purchase. Cash only upon pick-up or will provide Bank to Bank Wire Transfer information prior to pick up. 2001 Mako 192 Center Console Large and roomy for her class, the Mako 192 Center Console features a great ride and lots of standard amenities. This boat is easy to maintain, easy to trailer, and easy on fuel. A large bow casting platform with storage underneath is trimmed with an anodized aluminum bow rail. A spacious center console features cavernous storage inside, a forward seat with a drink box, plus tackle storage, and vertical rod holders. The Mako 192 has under-gunnel rod storage, aft seating plus casting deck with storage, and a rounded livewell large enough to hold all the bait. The integrated transom has a walk-through door to the swim platform. The Mako 192 is wide, stable, fast and dry. 2001 Mako 192 Center Console Located at our Beacon Sister Bay store in Door County,see Features, Options, & Upgrades for more information Large and roomy for her class, the Mako 192 Center Console features a great ride and lots of standard amenities. This boat is easy to maintain, easy to trailer, and easy on fuel. A large bow casting platform with storage underneath is trimmed with an anodized aluminum bow rail. A spacious center console features cavernous storage inside, a forward seat with a drink box, plus tackle storage, and vertical rod holders. The Mako 192 has under-gunnel rod storage, aft seating plus casting deck with storage, and a rounded livewell large enough to hold all the bait. The integrated transom has a walk-through door to the swim platform. The Mako 192 is wide, stable, fast and dry. 2005 Mako 192 Center Console Large and roomy for her class, the Mako 192 Center Console features a great ride and lots of standard amenities. This boat is easy to maintain, easy to trailer, and easy on fuel. A large bow casting platform with storage underneath is trimmed with an anodized aluminum bow rail. A spacious center console features cavernous storage inside, a forward seat with a drink box, plus tackle storage, and vertical rod holders. The Mako 192 has under-gunnel rod storage, aft seating plus casting deck with storage, and a rounded livewell large enough to hold all the bait. The integrated transom has a walk-through door to the swim platform. The Mako 192 is wide, stable, fast and dry. 2005 Mako 192 Center Console Located at our Beacon Sister Bay store in Door County,see Features, Options, & Upgrades for more information Large and roomy for her class, the Mako 192 Center Console features a great ride and lots of standard amenities. This boat is easy to maintain, easy to trailer, and easy on fuel. A large bow casting platform with storage underneath is trimmed with an anodized aluminum bow rail. A spacious center console features cavernous storage inside, a forward seat with a drink box, plus tackle storage, and vertical rod holders. The Mako 192 has under-gunnel rod storage, aft seating plus casting deck with storage, and a rounded livewell large enough to hold all the bait. The integrated transom has a walk-through door to the swim platform. The Mako 192 is wide, stable, fast and dry. 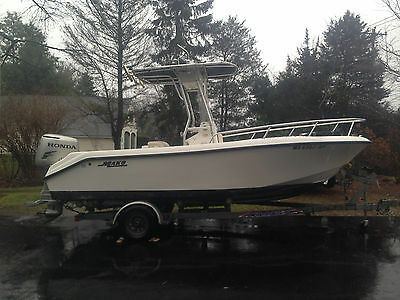 2002 Mako 19' CC 192 Center Console Fishing Boat Honda 4-Stroke T-Top Trailer - Good shape overall - Boat, motor and trailer package - Great boat to throw in and go fishing or have the kids use it. - 4-Stroke Honda Power Boat: - 19' Long - Center Console, with leaning post - Internal fuel tank - Raymarine A65 GPS - Fish Finder - T-top - Bow dodger - Full bow rails - Boat rides well for its size - etc... Engine: - 2002 Honda 130 hp Outboard Boat Motor - Unknown hours, but used for recreation purposes in Massachusetts. - Honda dealer maintained Trailer: - Single Axle Roller Galvanized Trailer in good shape - Working brakes - Working lights Boat is in good shape and is ready to go. Can be delivered shrink wrapped for a small additional fee. I can help deliver for a fee, however ultimately arranging delivery or pickup is your responsibility. Wholesale end of the year pricing, price will be higher in the spring. Great boat to export and I am happy to assist. I can get quotes for around the world delivery. Full payment due within 7 days of auction ending. I'm happy to assist however I can, as long as it is paid for. Since it is winter, storage fees will apply if left for over 14 days after the auction.